Governor Jim Justice allowed House Bill 2934 to lapse into law while neither signing nor vetoing it. Despite concerns about a veto, West Virginia’s Interactive Wagering Act (HB.2934) entered into law on Wednesday when the deadline for Gov. Jim Justice to veto the bill passed. Thus, West Virgina becomes the 4th U.S. state to have legal and regulated online casinos and the 5th U.S. state to have legal online poker — despite the sitting governor not signing the bill into law. West Virginias’s five land-based casinos can launch online casino and poker sites. Each of the five venues will need to apply for a 5-year license while paying a $250,000 licensing fee. The license is renewable each year at a cost of $100,000 for every five years. The operators must pay platform and service management fees of $100,000 every five years on an ongoing basis. Finally, West Virginia’s Treasury Department will charge the sites a tax of 15% on gross gaming revenues. The West Virginia Lottery Commission is stipulated as the regulatory agency which will oversee online gambling in the Mountain State. West Virginia’s legal online gambling industry received approval only months after the U.S. Department of Justice issued a legal opinion which stated that interstate online poker and casino sites violate federal law. When the DOJ’s Office of Legal Counsel announced the ban in January 2019, it reversed a longstanding position that online casinos and card sites are legal under the 1961 Wire Act. 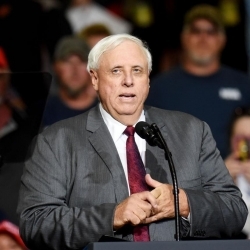 While defying the Trump administration’s new online gaming policy, West Virginia lawmakers cited states’ rights in legalizing and regulating iGaming. Lawmakers invoked the equal sovereignty principle of the U.S. Constitution, which asserts that states have equal sovereignty with the federal government. State governments have authority over anything not expressely reserved to the federal government in the U.S. Constitution. Since gambling is not mentioned in the Constitution, West Virginia’s legislators asserted states have the right to set their own gambling laws. The reference to West Virginia’s “exclusive right” to operate a lottery in the state might be why lawmakers chose to place online gambling under the auspices of the West Virginia Lottery Commission. Three of the other states which have approved online gambling placed licensing, regulation, and oversight under the authority of the state gambling commission (Nevada Gaming Commission, Pennsylvania Gaming Control Board, New Jersey Division of Gaming Enforcement). Only Delaware regulates its online gambling industry through its lottery commission. Such details might not matter, but if West Virginia faces a legal challenge from the U.S. Justice Department, its lawyers can reference the state’s 150-year old constitution to support its rights. It might never come to that. Though it received a lot of attention from the gaming media at the time, the US Department of Justice’s opinion is careful to state it bans interstate online gambling. That means intrastate (single-state) online gambling is legal under federal law, so long as the electronic gaming does not cross state boundaries. That means West Virginia’s gaming operators must make certain their sites are on West Virginia servers and online transmissions never cross out of the state. Online payments must be handled in-state, as well. It is an additional expense, but one that West Virginia gaming operators can count on prior to implementation. Otherwise, the federal ban on interstate online gambling means West Virginia cannot join the Multi-State Internet Gambling Association (MSIGA). MSIGA is an interstate poker compact in which Nevada, Delware, and New Jersey agreed to share player liquidity among its poker sites. Shared player liquidity means bigger entry fields for online poker tournaments, which in turn lead to bigger prize pools and bigger jackpots. West Virginia online poker might have limited revenue potential, for that reason. The online casino industry could produce a lot of revenues for land-based casinos and the West Virginia state government, though. Players can enjoy online slots, blackjack, roulette, or video poker without a big crowd. Whatever the case, West Virginia now joins the growing list of US states that welcome online gambling in one form of another. States like Georgia, Illinois, and New Hampshire do not have online casinos or poker rooms, but they do have online lottery ticket sales. The New Hampshire Lottery is suing the Department of Justice over the DOJ opinion on interstate online betting, for that very reason. West Virginia now becomes a new state that might sign on to such a lawsuit, or at the very least will have members of the US Congress to vote against further anti-online gambling laws.